Siem Reap has always been the gateway for the Temples of Angkor. Recently, though, it has become a lively and interesting destination with its offers of trendy hotels, bistros, art galleries, restaurants and boutiques. But what makes it more interesting is that this vibrant life Siem Reap offers is in the midst of villages centered around traditional rice cultivation, silk weaving and fishing. ​Though a center of the ancient Khmer civilization, Siem Reap is a young city as it only developed recently after Cambodia suffered from the ravages of the Khmer Rouge. It is still one of the poorest provinces of Cambodia. You can easily see this once you are out of the city center and the Archaeological Park. Just a very short drive outside of the city, you will see some of the poorest farmers still planting rice the traditional way. Cambodians like going to Siem Reap not only to worship at the Angkor Temples but also to enjoy the park with its huge trees which one can hardly find in many of the other provinces. There is still a rural feel to the city. Siem Reap has an international airport with daily flights from Thailand, Vietnam, Singapore, Malaysia, Laos, China and Korea. Visas are also available at the airport. Just have your passport with 6 months validity, a 4x6 photo of yourself and $30 for a tourist visa. Nationals of ASEAN countries are exempted from visas but there are qualifications to the exemptions. You can also get an e-visa now. For these exemptions and applications for an e-visa, visit this official government site. Multiple direct flights from Phnom Penh to Siem Reap are also available daily. But if you want a cheaper option, take the bus. Bus travel from Phnom Penh to Siem Reap is very popular as the roads and the buses have really been improved. Several companies offer air conditioned buses for around $13. If you want space, book two seats for yourself. Some of these buses targeted to tourists are very comfortable. From Siem Reap, there are flights to the beaches of Sihanoukville. Read this book that Angelina Jolie made into a movie recently. ​It is fascinating how this story has enabled so many others in Cambodia share their own experience of that time in their history. There also several public buses from Phnom Penh to Siem Reap. This trip will take around 5-6 hours. Of course, you can hire your own car or van and have the freedom to stop wherever you want and enjoy some of the attractions on the way. River ferries also operate this route but it is best taken during the rainy season when water level on the river is higher. During the dry season when water level is low, sometimes the ferry service is suspended. It gives you a glimpse of life on the river and the Tonle Sap, the biggest body of fresh water in Southeast Asia. Your hotels and guest houses can make the arrangement for you. You can also visit Siem Reap by bus from Bangkok. Take a bus to the border crossing, Aranyaprathet. This will take you about 3-4 hours. You cross over to Poipet, the Cambodian side. From there, take a shared taxi, hire one or let your hotel in Siem Reap pick you up. This trip from the border to Siem Reap will take you about an hour and a half or 2 hours. Stay where you can easily walk to the Old Market where the most fun is. During the non-peak tourist months, you can really grab a stay at some of the luxury hotels for less than a hundred bucks a night. These months are more or less from April - to August. So, plan your trip at this time. For budget travellers, you can get decent accommodation and in Siem Reap, there are lots of choices from as low as $10. Other than visiting the Temples of Angkor, there are many other things to do in Siem Reap. It is better to visit the temples early in the morning or late in the afternoon when the sun is not scorching. If you're a shopper or you just want to get a few souvenirs to bring for folks at home, this is a great place to browse. It is alive and full of knick knacks of various colours. But don't just look at the goods. Look up to see the buildings. Most of these buildings were built during the French protectorate so they're around 100 years old. Planners are now realizing that these old buildings are attractive to tourists. In fact, Cambodia has now listed buildings around the Old Market as part of the national heritage protected under the National Heritage Protection Laws. Other buildings that will soon be under protection are some of the old houses built of bamboo or wood raised on stilts. They tell of how the Khmer built their homes in the past, a tradition that needs to be preserved. Although shops are everywhere now with a few night markets competing with each other, you may not like many of the things sold in the market so if you want to bring home something worthwhile to remind you of your visit, go to Artisans d'Angkor and get one or two souvenirs. To preserve their traditional art and crafts, Artisans d'Angkor has established a center where villagers can learn the various traditional arts and crafts. The Khmer Empire and its kings' love for monuments has made the Khmer fine artisans especially of stone. ​They have traditionally carved stones as can be seen in the temples but they have also carved in wood and silver. Their silver jewelry are very fine and the same can be said of their cut precious stones. Here, you can watch artisans train villagers in these traditional arts and crafts and if you like one, let the artist sign it for you. If you like silk, go to the Artisans d'Angkor silk farm. There, you can see the age-old process of making silk from silk worms. Here again, villagers come and learn how to grow silk worms, spin silk fibers from the cocoons, and weave beautiful silk fabrics like the traditional ikat designs. Some of these are now collectible items. ​Another place to visit to have a first hand experience of Cambodian silk weaving is the IKKT, the centre Kikuo Morimoto founded. ​With a strong passion for silk, Morimoto researched about the Cambodian heritage in silk and established this centre. Just about 30 km. to the north of Siem Reap, the Centre welcomes day visitors as well as those who want to stay longer and experience life in the traditional Cambodian village. Nowhere in Siem Reap would you want to be in the evening than in this street. This street with its restaurants, shops, galleries and upscale bars is full of life once the evening starts. This is where most people go and dine al fresco after the French tradition. Pub Street also has a number of the restaurants and galleries so there is so much to enjoy. Some restaurants have the Apsara shows as well so as you eat, you also enjoy and learn something about Cambodian culture. While here, try putting your feet for the fish to clean up in one of those fish aquarium or haggle for souvenirs in one of the shops. Some of the shops are owned by non-government organizations who do development work so it is always good to support them. Below is a video of the latest craze in Pub Street: Fried Ice Cream Rolls. There are many flavours to choose from and you enjoy watching them do it. The guy on the right is the one who flags the flavours and this guy in the middle makes it. So refreshing in such a hot climate. The only cultural village in the country, the Cambodian Cultural Village in Siem Reap gives visitors a peek at the country's rich cultural heritage in the various villages such as the Cham, the Chinese, the Kola, Kroeng, Surin, Khmer and even the Cambodian immigrants abroad have their own typical village. Inside each of these villages are presented different Khmer architectural styles, traditional dance performances, traditional wedding ceremony, and games. Take a boat to where the fishermen live in Tonle Sap. A combination of lake and river system, Tonle Sap is the biggest body of fresh water in Southeast Asia measuring about 16000 sq.km. wide and nine meters deep during the rainy season. It has been designated as a UNESCO biosphere reserve in 1997. This includes the surrounding provinces of Banteay Meanchey, Battambang, Kampong Chhnang, Kampong Thom, Preah Vihear, Pursat, Siem Reap, Oddar Meanchey, and Pailin giving you a picture of how big Tonle Sap really is. It is one of the most productive inland fisheries in the world providing around 75% of Cambodia's annual fish catch. 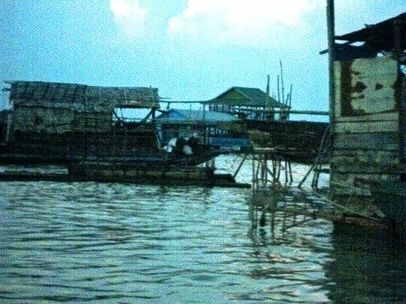 Because of the abundance of fish, floating villages where fishermen and their families live abound in Tonle Sap. These floating villages have now become a must see for tourists. While I am not in favor of gawking at other people's lives, this is truly interesting. Stay the day and observe how people live and interact with the large numbers of tourists who now come and visit. It might still make a sociologist of you. And don't forget to ask your hotel to book you in one of the restaurants offering the Apsara show. Interested in Apsara? Click here to know more about Cambodia's traditional dance. ​Go for less than an hour drive and bring your picnic there. Do this in the morning as those visiting transport go up one way. In the afternoon, the road is for going down. It is fun to stay for some time and enjoy its natural beauty including waterfalls. Khulen played an important part in Cambodia's history. This mountain supplied the earth that built the Angkor temples. When visiting this place, there are lingers and other structures reminding you of its ancient history. This Temple is worth a visit. If you have seen the movie, Two Brothers, you will find this place familiar. It was only in 2005 that this place was opened to tourists as it has to be demined and cleared. It is easy to move around the complex as there are walkways. This recently Cambodian-Thai contested UNESCO World Heritage site is a must visit place. This will open your eyes to the vast Khmer Empire that used to rule parts of Thailand, Laos and Cambodia. 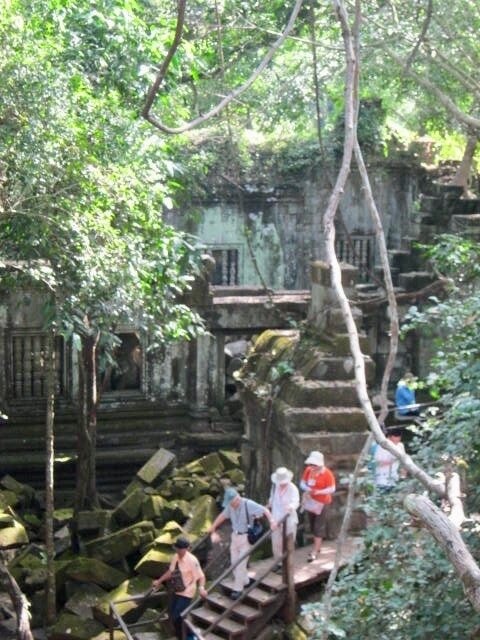 ​Have you been to Siem Reap? What would you recommend to those who want to visit? Before you leave, please leave your answer or comments below. And don't forget to share this post.